To determine if a given row has already been processed, the adapter uses the information in the KeyFieldName setting; see “Processing Only New Rows” later in this chapter. Otherwise, the adapter builds an instance of the EnsLib.SQL.Snapshot class and puts the row data into it. This instance is the snapshot object. “Using the Default Snapshot Object” later in this chapter provides details on this object. The internal ProcessInput() method of the business service class executes. This method performs basic production tasks such as setting up a monitor and error logging; these tasks are needed by all business services. You do not customize or override this method, which your business service class inherits. The most common reason to initialize the adapter is to initialize values for use as parameters of the query, as described in “Specifying Inbound Queries.” The following subsections list the relevant methods and provide an example. Within the Parameters setting, if a parameter name starts with a dollar sign ($), InterSystems IRIS assumes that it is a property of the service class. Within the Parameters setting, if a parameter name starts with an ampersand (&), InterSystems IRIS assumes that it is a special persistent value. If you specify the KeyFieldName setting, the adapter adds data to an InterSystems IRIS global that indicates which rows it has processed. This setting should refer to a field that contains values that are not reused over time; this field must be in the result set returned by the query. The adapter uses the data in that field to evaluate whether a row has previously been processed. This technique can be inefficient because InterSystems IRIS might select a large number of rows during each polling cycle, and only a small number of those rows might be new. Upon polling, if the adapter finds input, it creates an appropriate InterSystems IRIS object and passes the object to its associated business service. If several inputs are detected at once, the adapter processes all of them sequentially until no more are found. The adapter sends one request to the business service for each item of input it finds. The adapter then waits for the polling interval to elapse before checking for input again. This cycle continues whenever the production is running and the business service is enabled and scheduled to be active. 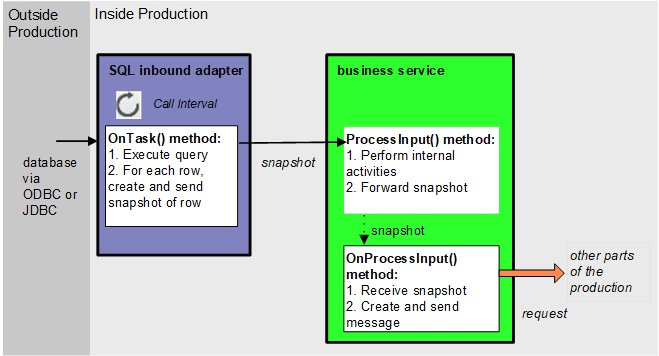 It is possible to set a property in the business service so that the adapter delays for the duration of the CallInterval in between processing each input. For details, see Developing Productions. If this setting is 1, the adapter auto-connects on startup and then stays connected. Use this value, for example, if you are managing database transactions as described in “Managing Transactions,” later in this book.